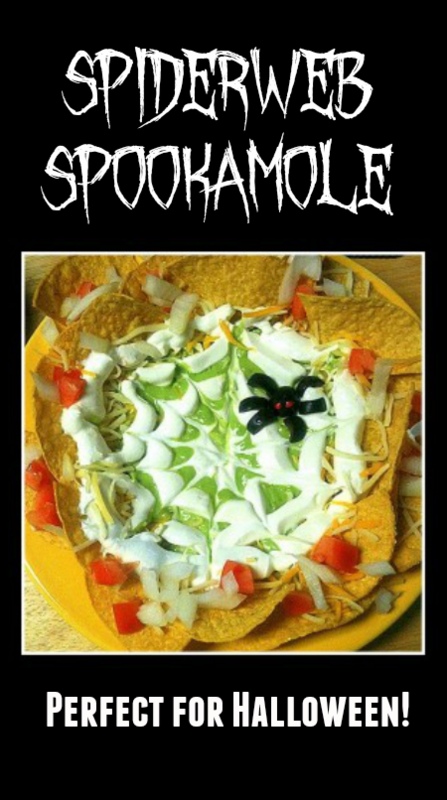 Spiderweb Spookamole Recipe – A Fun Halloween Appetizer with Guacamole! I love fun Halloween recipes. It seems like there are always lots of cute “sweet treat” recipes for Halloween, but not so many for “real” food. 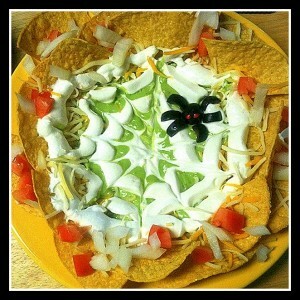 So, that makes this Spiderweb Spookamole dip recipe extra special. It can make the perfect appetizer for a Halloween party, or use it as a late night snack after an evening of Trick-or-Treating. Thanks to Meagan from Sunshine and Sippy Cups for sharing this fun and easy recipe! Start with a big plate. Shmear a layer of refried beans over the plate, stopping about an inch from the edges. Mix up your favorite Guacamole or use this Spookamole recipe. Then spread a thick layer of guacamole over the beans. Add tortilla chips around the edges, and layer with cheese, tomato, onion, and cooked/seasoned ground beef. To decorate: Fill a zip-top baggie with appx 1 cup of sour cream. Snip a corner off the bag to use as a decorating bag. Draw circles of sour cream, starting at the outside edge of the plate with the circles getting smaller as you move toward the center. To make the spider, place a whole olive on your web and then add olive slices to each side for the legs. To make him extra creepy, use a small tube of red cake decorating gel to dot on two little eyes. 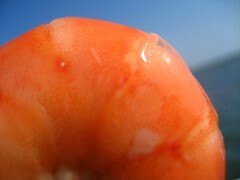 If you want to serve shrimp as an appetizer, but don’t want to spend a fortune, try this shrimp dip as an alternative. It uses just one 4.5 oz can of shrimp, so you still get shrimp taste without shrimp expense. Mix first 3 ingredients until creamy. Add rest of the ingredients and stir well. Serve with crackers or small toasted garlic rounds. This delicious recipe is perfect for an appetizer or can make a satisfying lunch all on its own. It’s a new favorite of mine for using fresh garden tomatoes. But, if you DO use fresh tomatoes, they are usually much juicier than “store bought” tomatoes, so I recommend draining the sliced tomatoes for a few minutes by laying the slices in a strainer or set them on paper towels. Heat oven to 350 degrees. Split loaf down the middle and butter each side. Sprinkle with garlic powder. Lay tomatoes in an even layer over the bread. Drizzle with olive oil (I like to use an oil mister). Sprinkle with salt, followed by the oregano. Sprinkle the cheese evenly over the top. Bake 10 minutes or until cheese has melted. Turn oven to broil and broil until cheese begins to brown. This easy recipe, courtesy of Old London, is great for ringing in the New Year. Remoulade, tarter sauce or your favorite dipping sauce. 1. Whisk together mayonnaise, green onions, egg yolks, lemon juice, mustard, and Old Bay. 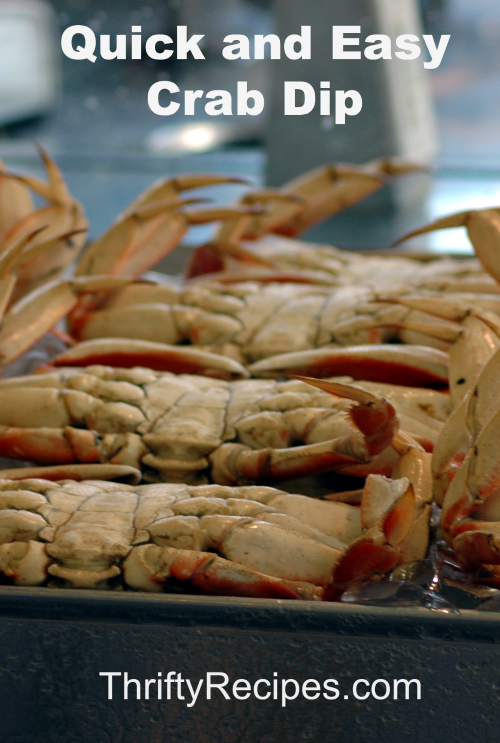 Gently stir in crabmeat. 2. Place Melba Toast Sourdough on cookie sheet, and form 2 heaping teaspoons crab mixture onto each Toast. Gently coat moist crab mixture with bread crumbs. 3. Chill, covered, at least 1 hour. 5. Bake crab cakes in batches in middle of oven until crisp and golden, 8 to 10 minutes. 6. Transfer with a spatula to a platter and garnish with lemon and serve with your favorite sauce. These wafers are great as a base for your favorite party appetizers and dips, or you can just eat them “as-is” for a snack. Place flour in a medium bowl. 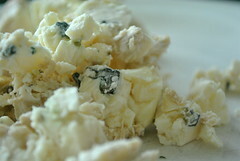 Cut butter and cheese into small pieces and add to flour. Use a pastry blender or two knives to cut butter and cheese into the flour until the mixture looks like cornmeal. 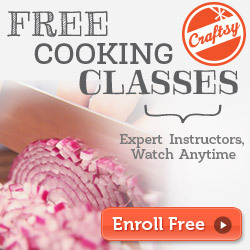 Form dough into a 1 1/4″ diameter cylinder. Wrap in plastic wrap and freeze for two hours. Remove from freezer and preheat oven to 400 degrees. Cut 1/8″ slices from the dough and place on ungreased baking sheet. Sprinkle with sesame seeds and press lightly so they adhere to dough. Bake 5-6 minutes or until just beginning to brown. Store in a sealed container. This crab dip recipe only uses one 6 1/2 ounce can of crab meat, so it’s a great way to “stretch” an extravagant food into a perfect party appetizer. Recipes makes 3 cups of dip, which should serve 10-12 people. Combine all ingredients and chill for a minimum of two hours. Serve with crackers or toasted bread rounds.